We're now back home in Florida! We had a fabulous time in Europe & in KC for our various shows. It's good to be home though, and you can bet I'll be painting up a storm. Mostly this month I'm working on new Disney paintings for my event at WonderGround Gallery at Disneyland in California this autumn (for details click HERE) so I can't show you those yet. But I'll be squeezing in some other projects too, so keep an eye out! #1 New Stilleven Painting! A new original painting to show you - "Stilleven III: Citroen" (still life 3 - lemons!) - this is one that debuted and sold at the Spectrum Fantastic Art LIVE event. The original of course was sold at the show, but I now have $9.99 SALE signed prints & Limited Edition Canvas Prints up on eBay HERE. #2 New fairy figurine to promote Autism Awareness! A very special collection of statues I have developed with the Hamilton Collection to raise funds for the Autism Society of America. A very important cause, I have known so many people whose lives have been touched by autism. Please show your support and definitely "Share" this with anybody you know who would appreciate it! 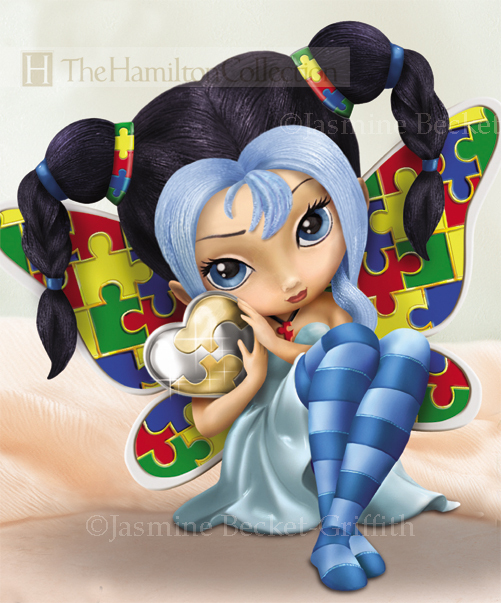 A darling fairy figurine with the autism "puzzle piece" theming, these are only available as a fans-only pre-order at Hamilton by calling 1-877-268-6638 and let them know you are interested in Jasmine Becket-Griffith's "Magic of Caring" item #09-05434-001 - for more details, Click HERE or scroll down to the end of this mailing list update. #3 CONTEST! Pop Gallery at Disney World's Downtown Disney is GIVING AWAY a 10x10" Signed Faces of Faery Canvas! And it's very simple to enter - all you have to do is comment on their Facebook post and tell them which Faces of Faery is your favourite painting in the series. The winner will be chosen by Pop Gallery and will receive a special signed 10"x10" Gallery Wrapped Faces of Faery Canvas, signed by ME of course! Click HERE to go to the specific post you need to comment on Be sure to also click "Like" on Pop Gallery's main Facebook Page here to keep updated on this and other gallery-related promotions & events! Don't have all the Faces of Faery memorized (that's okay, I don't either!) - you can see all of the Faces of Faery paintings at Pop Gallery HERE first to pick out your favourite before posting on the contest entry post HERE. #4 Loads of new penny auctions & other new stuff at StrangelingEmporium! My sister Amber & her husband Chris have been adding all sorts of new rare, autographed, framed, sold-out, and limited edition artwork & merchandise of mine to their eBay store - StrangelingEmporium - click HERE including lots of auctions that start at just one penny to bid. Their eBay ID is StrangelingEmporium and they are also now up at Facebook HERE. Definitely bookmark their store, click "Like" on their Facebook and get in on some of the most unique items (and best deals!) featuring my artwork in the world. They are always happy to ship worldwide. Stilleven III: Citroen - a New Original Painting from Jasmine! "Stilleven III: Citroen" - a piece that debuted and sold at the Spectrum Fantastic LIVE art show. This "Stilleven" (Dutch word for "Still Life") - is the third in a series of works I have planned that feature "deconstructed" elements of still lifes inspired by the Dutch master painters of the 1500-1600s, along with faeries & nymphs (of course!). Citroen means "lemon" (which features prominently in this piece) - a lot of fun details in this one, all popular elements included in historic Dutch still life paintings. The original itself sold at the show but I have prints & posters available! The Magic of Caring - click here for a close-up picture! Autism Awareness fairy figurine fundraiser - "Magic of Caring" item #09-05434-001 $39.99 A new resin Lt. Ed. figurine/statue! Call toll-free to order: 1-877-268-6638 - PLEASE share this with anybody you know whose life has been touched by Autism! A percentage of each sale of this figurine will go directly to the Autisum Society of America. Call 1-877-268-6638 and ask for Jasmine Becket-Griffith's "Magic of Caring" fairy statue - item #09-05434-001 asap. A very important cause that has affected so many people, I am so pleased to finally debut this figurine to help support Autism Awareness! You folks online are the first people to see her as we are debuting her now as a fans-only FREE PREVIEW test-market - so all you guys need to do to help launch this new statue series is call toll-free 1-877-268-6638 and let them know you are interested in Jasmine Becket-Griffith's "Magic of Caring" item #09-05434-001 - When the test market launches they will send you the figurine for a 30-day free preview & will NOT charge you a penny until your statue ships out, and they have a 100% hassle-free return program guarantee). So definitely call asap & show your support! "Offered in Limited Editions & Graced with a Special Remarque Offered in limited editions of 95 casting days, each is hand-numbered and painted by hand. A matching numbered Certificate of Authenticity comes with every figurine, denoting its status within the series. Subscribe today and you can look forward to each new pair as it is released. This is a SNEAK PREVIEW and only fans who see this can pre-order now! These are not online or for sale anywhere else yet, you need to call by phone to reserve yours (no money now, of course!). And since these are from the Hamilton Collection, you of course get the "Best-in-the-Business 100% Satisfaction Guarantee" - You risk nothing by ordering today: your 100% satisfaction is assured by our unconditional, 365-day money-back guarantee. If for any reason you wish to return any edition in your collection up to a FULL YEAR from time of receiving it, you may do so, no questions asked, for a TOTAL REFUND! As usual, this first pre-order is through the USA division of the Bradford Group. However if things go well it should be available through their international divisions in the future soon!